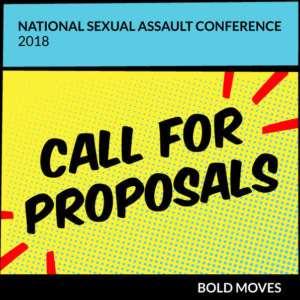 The Call for Proposals is now open for the 2018 National Sexual Assault Conference (NSAC). The annual conference will be hosted by the California Coalition Against Sexual Assault and held August 29-31 in Anaheim, California. The theme of the 2018 conference is, “Bold Moves: Ending Sexual Violence in One Generation.” As the theme implies, prevention will be a key focus area. Presentation or workshop submissions to the Prevention track should describe efforts to engage communities in the primary prevention of sexual assault. Submissions should feature evidence-based or evidence informed work that draws on the best available research or presents current research that can inform the sexual violence prevention practice field. Proposals must be submitted by January 16, 2018. Click here for information on how to submit a proposal. For more information about NSAC 2018, please click here.